In work the mechanical properties of polyimide films analogue kapton-H (manufactures of the People's Republic of China) by thickness 75 microns are studied in conditions of uniaxial stretching at temperature 293 K after influence of space factors - a separate and joint irradiation by protons and electrons with energy Е=160 keV and fluence (the total flow of particles with incident on the samples) F=1016 cm-2. The limit of the forced elasticity, the ultimate strength, the total strain before fracture and the contributions to the total deformation related to the elastic deformation occurring in the linear stage, the total forced elastic and irreversible deformation that contribute to the overall deformation of the samples at the nonlinear stage are determined. The total forced elastic deformation consists of a highly elastic deformation, reversible at the test temperature, and delayed elastic deformation. After exposure to irradiation, an increase in the limit of the forced elasticity of the films by 5-11%, a decrease in the ultimate strength by 10-14%, and a reduction in the total deformation by 20-28% were found. The maximum change in all mechanical characteristics occurs under the influence of proton irradiation. It is established that the decrease in the total deformation of irradiated films is mainly due to a 80% reduction in the contribution of irreversible deformation. The contribution of the total forced elastic deformation of the polyimide film practically does not change after irradiation, which has important scientific and applied significance. Bessonov M.I., Koton M.M., Kudryavtsev V.V., Layus l.A. Polyimidyu – klass termostoykih polymerov [Polyimides – class of heat-resistant polymers].-L.: Nauka, 1984.-328 p. (in Russian). 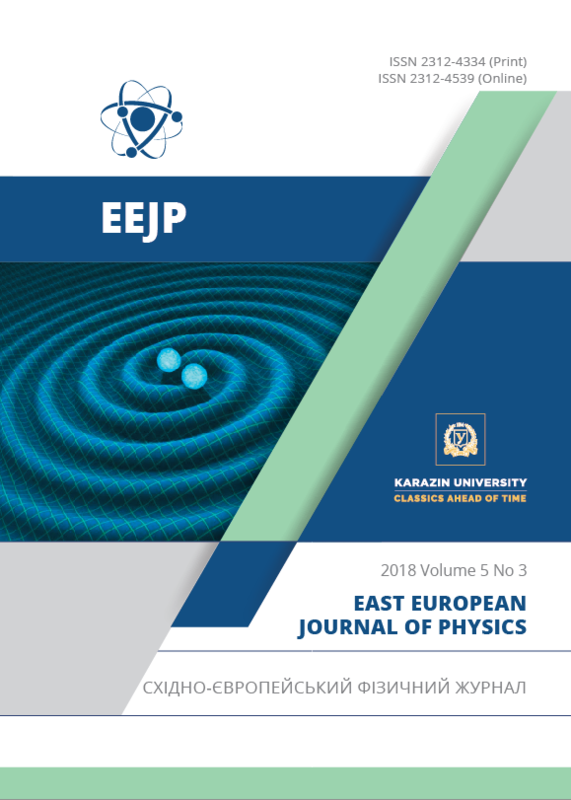 Lototskaya V.A., Yakovenko L.F., Aleksenko E.N., Abraimov V.V., Wen Zhu Shao Low temperature deformation and strength of polyimide films due to thickness and deformation speed //East.Eur.J.Phys.-2017.-Vol.4. - No2. - P.44-52. Volikova L.М., Chernetskiy V.K. Nizkotemperaturnaya pristavka k razryvnoy mashine 1231Y10 [Low temperature unit to tensile testing mashine] sb. Prikladnoe kriogennoe i vakuumnoe materialovedenie [Applied cryogenic and vacuum material science] pod red. Lavrentev F.F. -Kyiv: Nauk. dumka, 1991 – P. 137-143 (in Russian). Abraimov V.V., Negoda A.A., Zavalishin A.P., Kolybaev L.K. Kompleksnayu imitatsiya faktorov kosmicheskogo prostranstva [Complex imitation of space factors ]// Kosmichna nauka i technologiya [Space Science and Technology].-1995.- Vol. 1. – No 2-6. - P.76-80 (in Russian). Abraimov V.V., Agashkova N.N., Bone L., Budnyak I.V., Velichko N.I., Krevsun A.V., Kostenko V.I., Lura F., Markus A.M. Kompleksnye issledovaniya fiziko-mechanicheskih svoystv materialov svetopogloshchayushchih pokrytiy kosmicheskih apparatov proektov “Mars-96” I “Regata” pod vozdeystviem factorov kosmicheskogo prostranstva [Complex researches of physico-mechanical properties of materials of light-absorbing coverings of space vehicles of projects «Mars -96» and "Regatta" under influence of space factors ] // Kosmichna nauka i technologiya [Space Science and Technology].-1995.-Vol.1. -No.1.- P.57-68 (in Russian). Abraimov V.V., Lototskaya V.A., Zaritskiy I.P., Saltevskiy G.I. Vliyanie factorov kosmosa (nizkih temperatur, zaatmosfernogo solntsa, potokov protonov I elektronov) na mehanicheskie svoystva nekotoryh polimerov [Influence of space factors (low temperatures, the exoatmospheric sun, streams of protons and electrons) on mechanical properties of some polymers] //Abstr. 55 Internat. Conf. “Aktual’nye problemy prochnosti” [Actual strength problems], 9-13 april 2014.- Kharkov, Ukraine.- P. 158 (in Russian). Abraimov V.V., Bocharov K.Sh., Danovskiy V.V., Udovenko V.F. Vliyanie VUF – izlucheniya na deformatsionnye i prochnostnue svoystva polietilena v intervale temperatur 200-350 К [Influence of VUV-radiation on deformation and strength properties of polythene in the temperature interval 200-350 K] // sb. Radatsionnaya stoykost’ organicheskih materialov v usloviyah kosmosa [Radioresistance of organic materials under space conditions].- M.,NIITEHIM, 1989.- Vyp.8.- P.21-25 (in Russian). Verkin B.I., Udovenko V.F. Abraimov V.V., Bocharov K.Sh. Vliyanie elekteromagnitnogo izlucheniya v oblasti 0,01-25 mkm na mehanicheskie svoystva nekotoryh polimernyh materialov [Influence of electromagnetic radiation in the field of 0,01-25 microns on mechanical properties of some polymeric materials] // sb.Kosmichna nauka i technika [Space science and technology ].- Kyiv: Nauk. dumka, 1988 .-Vyp.3.-P.54-57 (in Russian). Abraimov V.V., Bocharov K.Sh., Galuza A.I., Udovenko V.F. Vliyanie elekteromagnitnogo izlucheniya v oblasti 5-2500 nm na mehanicheskie I opticheskie svoystva nekotoryh polimernyh materialov [Influence of electromagnetic radiation in the field of 5-2500 nanometers on mechanical and optical properties of some polymeric materials] // sb. Radatsionnaya stoykost’ organicheskih materialov v usloviyah kosmosa [Radioresistance of organic materials under space conditions].- M.,NIITEHIM,1989.- Vyp.10.-P.23-30 (in Russian). Abraimov V.V., Bocharov K.Sh., Danovskiy V.V., Udovenko V.F. Issledovanie vozdeystviya elektromagvitnogo izlucheniya v oblasti 5-2300 nm na fiziko-mehanicheskie svoystva polimernyh materialov [Investigation of physical-mechanical properties of polymeric materials under influence of electromagnetic radiation in the field of 5-2500 nanometers] // sb. Prikladnoe kriogennoe i vakuumnoe materialovedenie [Applied cryogenic and vacuum material science] pod red. Lavrentev F.F. -Kyiv: Nauk. dumka, 1991 – P. 103-109 (in Russian).